Last year Project Holiday provided gifts for 109 children and food for 292 children and adults during the Holidays, at a time when those families might not have been able to provide such items themselves. This would not be possible without generous contributions and volunteer help from people like you – it is truly a community-wide effort! We begin accepting applications for the Holiday assistance in late October, and at the same time also begin to seek volunteers willing to either sponsor a family or make a donation. If sponsoring a family is beyond your means, but you would like to help, consider getting together with family or friends to share the expense and make someone else’s Holidays brighter. Any help you can give will be greatly appreciated. Please call or e-mail us using the contact information at the bottom of this page, give us your name and telephone number, and we will call you with details about how you can help. Project Holiday is a Yarmouth, Maine project that is coordinated by YCAN, the Yarmouth Community Food Pantry, the First Parish Church, Yarmouth Community Services, the Yarmouth School Department, the Lions Club, and other local organizations. It is truly a “community-wide” project. What can you do for Project Holiday? 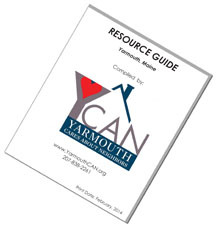 To volunteer for Project Holiday, e-mail Yarmouth Cares About Neighbors (YCAN) at ycan@ycan.info or call 207-838-2261. To donate funds for Project Holiday, please see our Donate Money page.